Tomorrow marks the official first day of summer in the Northern Hemisphere. In the dessert world, for some odd reason, I connect white chocolate with summer. I am not exactly sure why, perhaps it’s the color or the sweet smooth taste, but, the two have a connection, in my opinion, that I cannot explain. Not too long ago, I told you that having chocolate at home can be quite tricky in Thailand. Usually, that tends to hold true, but, things have changed a little since the start of the rainy season. It’s not cold my any means, but it has cooled down! That being said, although the temperature has dropped most days, the humidity that comes with all the rain is another challenge in itself. When I came across these freeze-dried strawberries at a 7/11, right away, images of a white chocolate project I came across on Pinterest popped up in my head. (Note: 7/11 in the US or Canada most likely won’t have freeze-dried strawberries, but maybe try Trader Joe’s or even Amazon). The creator of that particular recipe that happened to pop into my head project is Jeanny. 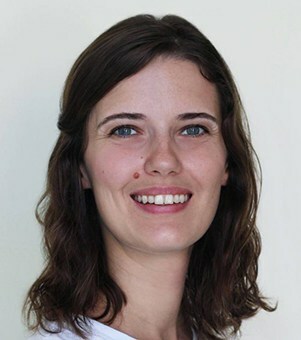 She is the writer and creative mind behind the German blog Zucker, Zimt & Liebe (means: Sugar, Cinnamon & Love). Some of you may know that I am from Germany, so I have no problem reading her blog, but, I understand for many of you, it might be a different story. Even if you can’t read it, it’s worth checking it out just for all the amazing pictures of her creative sweet treats (She is a great photographer and food stylist; I wish I lived closer to be able to attend one of her food photography workshops). 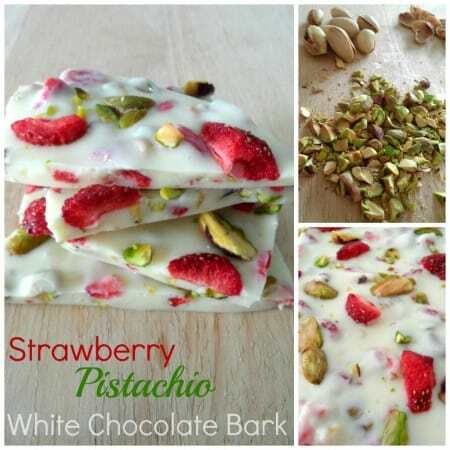 In addition to the freeze-dried strawberries from 7/11, I also picked up some pistachios and imported white chocolate to create my own colorful, fruity summer chocolate! I thought the pistachios added a nice, green look appropriate for the summer season. 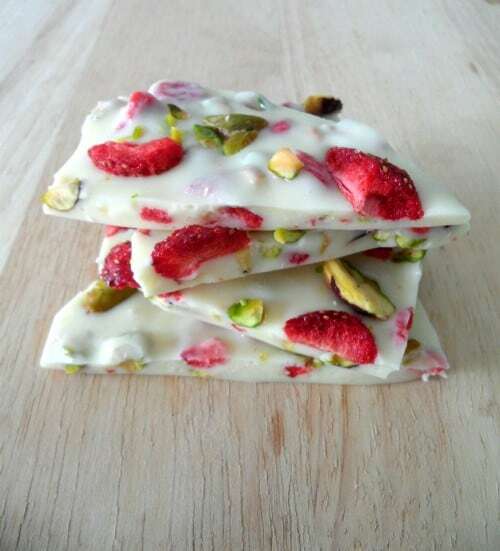 For some reason, the colorfulness of the strawberries and pistachios alongside the crisp, elegant white chocolate just screamed “summer” to me. 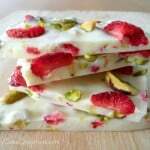 Strawberries and pistachios also seem to make a great summer snack and who simply doesn’t love white chocolate? 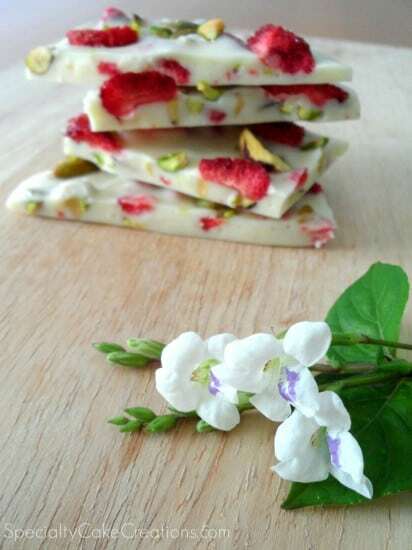 Creating this white chocolate bark is quite simple, but when you add in the challenge of tropical humidity things tend to get a little more interesting. To set up the chocolate it has to first be chilled in the fridge for a while. Of course, if you’re reading this from a colder. (or just more even mannered) location, then, thankfully, you won’t have to worry about such things as your chocolate melting right before your eyes! 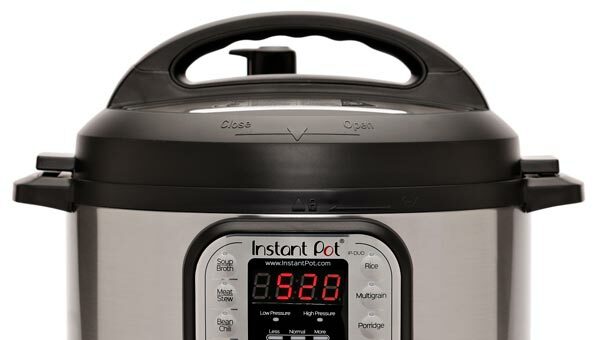 Well, as soon as we take anything out of the freezer or refrigerator, condensation settles on it in an instant. You might still see a few droplets in the pictures, because my attempt of drying the condensation (in front of the fan) unfortunately, wasn’t completely successful. 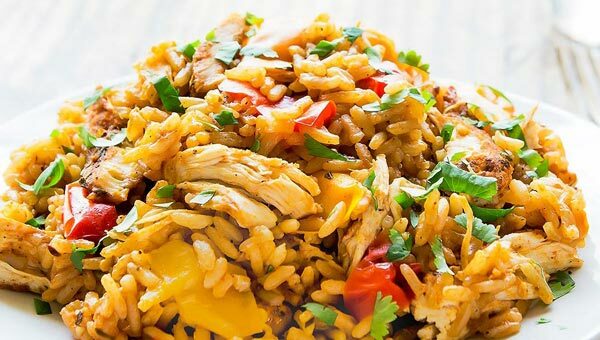 This recipe is for a small portion for just my husband and me. But you can easily multiply it. 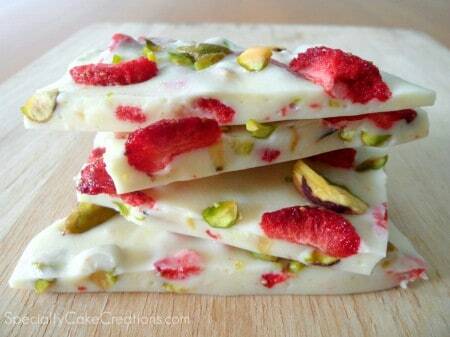 Chop pistachios and strawberries (if necessary). Break chocolate into small square or cut into chunks and melt in double-boiler or microwave. Stir in pistachios and strawberries (reserving some) and pour mixture into a lined pan. Spread out and flatten with a spatula. Sprinkle remaining pistachios and strawberries on top. 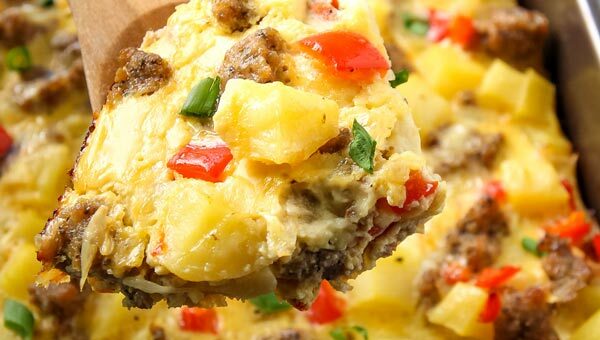 You can easily modify this recipe to taste or with whatever you have on hand. 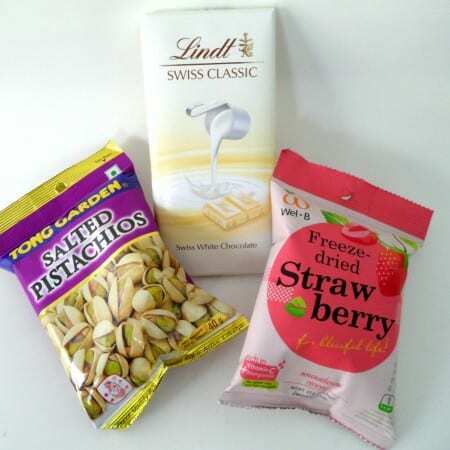 For example, replace the strawberries with dried cranberries, raisins or candied fruit. Or replace the pistachios with any type of other nuts. Salted kinds work just as well, as they help to cut the sweetness of the white chocolate. I hope you all have a great start into summer and enjoy this warmer season to the fullest with time spent outdoors, BBQs, light summer desserts and lots of ice cream! 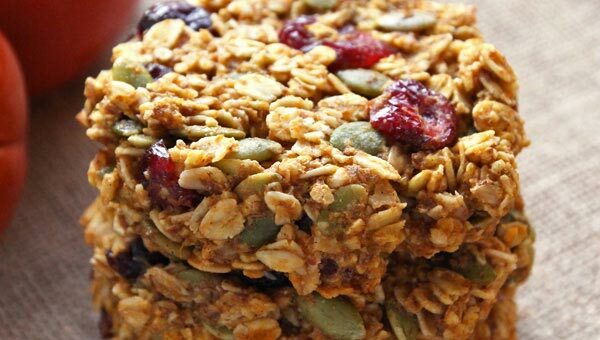 I have tried a very similar recipe only with freeze dried raspberries. I found the chocolate soft and didn’t set hard. Next time I tempered the chocolate and it was fine. You don’t mention tempering the Lindt chocolate, how does your bark stay hard and crisp ? Hi Patricia, at the time of posting that recipe I didn’t know much about tempering chocolate (maybe it’s due for an update?). Nowadays I mainly melt chocolate in the microwave in small bursts. This way some of the pieces are still unmelted/cooler. They melt as I stir, distributing some of their cooler temperature and essentially tempering the chocolate. It’s not the technical/professional way, but it works to produce a nice snap in the chocolate bark. I want to make this for favors for my daughter’s December wedding, with cranberries! How long will it last? 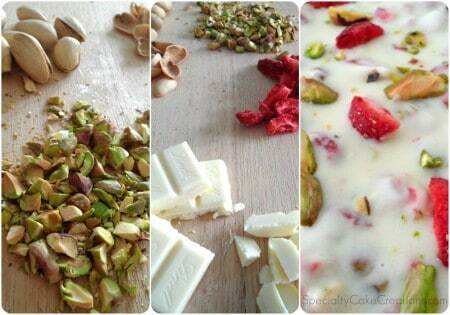 White chocolate, pistachios and dried cranberries have long shelf-lives. I’d think this should keep at room temperature for several months. This is delicious thanks Regina. I’m not keen on dark or milk chocolate so am always looking for yummy white chocolate recipes. Am taking it as a hostess gift for a lunch we’re going to. it is truly divine! Thanks so much! You did a fantastic job and I don’t personally think you need any help photographing your work! My mom always loved white chocolate bark and I’d like to try my hand at surprising her with some. Und ich stöber jetzt den Nachmittag durch auf Deinem wunderschönen Blog! Wie hat es Dich nach Kanada verschlagen? Vielen Dank fuers Vorbeischauen, Jeanny! Diese kontrastreiche weisse Schokolade war und ist noch immer DER Hit! Ja, Kanada…meine Familie ist vor sechs Jahren hierher ausgewandert und dann habe ich hier meinen Mann kennengelernt 😀 Und auch das Land und den Rest der Leute lieben gelernt. Thank you for visiting Laura! This bark was really easy to make but such a showstopper! Wouldn’t you think the red and green colors would also work for winter/Christmas? Use craisins for winter bark. It looks very festive and it’s so good. Thank you so much for your feedback, Jacquee <3 I love the options ZipList offers, but I am also still figuring out the best way to use it on my site. All the instructions I got were for WordPress. But hopefully they'll come out with it for Blogger too.